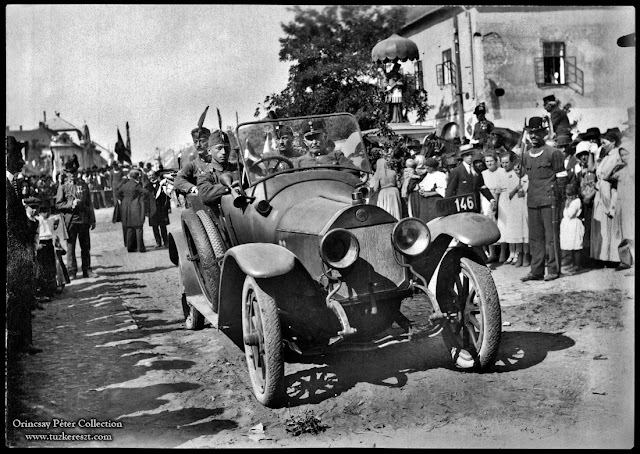 The second car in Admiral Horthy's motorcade at his visit in the newly reclaimed city of Mohács. To the left in the back seat sits the admirals aide-de-camp captain László Magasházy. The feathered caps is the sign of the National Army (Nemzeti hadsereg) that was formed in Szeged in 1920 and would soon transform into the Royal Hungarian Army. This photograph is from a series of photographs documenting the entry of of the National Army in to Mohács and admiral Horthy's visit. The series is a part of the photo-album of the local Mohács resident and member of the National Army, captain Lajos Schmitt, who later became a Hungarian member of parliament in the mid 1930th.